Avoid the tourist traps and overdone destinations. Not only is Vietnam a convenient and affordable travel destination for Filipinos—it is also rich in natural beauty, culture, and history. While it’s similar to the Philippines in many ways, having a well-researched itinerary will save you from boring tourist activities, while also giving you a memorable experience you won’t get anywhere else. We’ve put together a list of sites in the big cities, as well as in between, to help you figure out how to get the most out of your next trip to Vietnam. Ho Chi Minh City, also known as Saigon, has a lot to offer in the way of historical and cultural sites. And the Opera House is one of its must-see destinations. Over a hundred years old, it was built by the French, and echoes the 19th century architecture of Europe. Even if you aren’t interested in watching a show here, it’s still worth stopping by as you explore downtown Saigon. If you’re looking for a more modern marvel, stop by the Bitexco Financial Tower in Saigon. With 68 floors, this skyscraper one of the tallest buildings in Vietnam, and has an observation deck that offers a 360-degree view of the city. For a sensory experience of Saigon’s vibrant energy, stop by Dong Khoi Street day or night. The lights, sounds, smells, and tastes are dizzying in the best way. Whether you want to shop, enjoy a break at a cute cafe, admire the colonial architecture, or take in the beauty of the Saigon River—Dong Khoi Street has got you covered. If your idea of the perfect vacation is relaxing on a beachfront resort, look no further than Evason Ana Mandara on the Nha Trang Bay. While it faces the serene sea, it is also set close to the bustling city center—an ideal location for those who want to have options! Hue is one of Vietnam’s most charming cities, and Pilgrimage Village is one of the most beautiful accommodations in the area. This boutique resort, with its tranquil gardens and picturesque bungalows, is rustic, romantic, and connected to both the local environment and culture. Expand your horizons. Visit this village in the central highlands of Vietnam to learn about the many different ethnicities that live in the country. This hub is surrounded by indigenous mountain communities, so it’s the perfect way discover a new way of life. This eclectic guesthouse has been drawing crowds to the south Vietnam town of Da Lat. Influenced by the Spanish architect, Gaudi, the house looks straight out of a fairytale—tree-like and cavernous, complete with branches growing out of the windows! If you’re yearning for some natural beauty, luxuriate in the lush vegetation of Bach Ma National Park. Located in one of the wettest parts of the country, this area is teeming with life. Both flora and fauna thrive in this park that houses multiple ecosystems. It’s the perfect place to visit if you want to connect with the earth. Visit this national park, and you’ll get views of the sea, the mountains, and the forest. You may also see some endangered animals roaming around! One of the highlights of the park, though, are the enormous caves (some of which you can even camp in)—so don’t miss out on this central Vietnam stop! Ha Long Bay is one of Vietnam’s most popular tourist spots for a reason. Legend has it that that the islands were formed from dragons. Whether you believe that or not—you won’t be able to deny that there is something magical about this place. If you want to veer off the beaten path, and avoid the crowds at Ha Long Bay, stop by Bai Tu Long Bay instead. It is a little further out than its more popular counterpart, but just as gorgeous. Missing island life? Don’t worry, Vietnam can offer you a tropical paradise too. Visit the Cham Islands off the coast of central Vietnam. It’s a visually-stunning site for swimming, snorkeling, and diving. 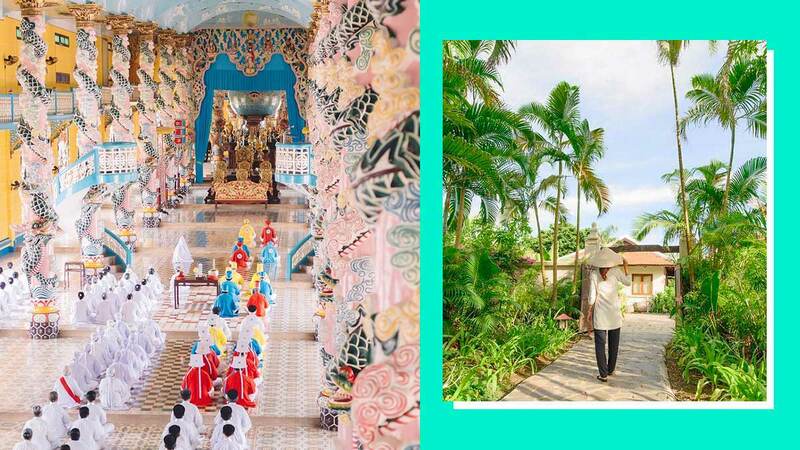 For a different take on Vietnam’s culture, be sure to check out the beautiful and underrated Cao Dai Temple. Tucked away in the south of Vietnam, this site is the central hub for a little-known religion called Caodaism. Seeing their place of worship, as well as learning about their values is a great way to gain a wider perspective of the country as a whole. Active travelers will love visiting Mui Ne. This fishing town experiences strong gusts of wind from the sea, and so it has become a popular site for kitesurfing and windsurfing. The breeze has also created gorgeous sand dunes that will challenge your preconceived notions about Vietnam’s landscape! If you’re into hiking, don’t miss the Sa Pa Terraces in north Vietnam. While you’ll be trekking through some pretty high (and muddy!) altitudes, the endlessly gorgeous sights will be worth it. Plus, if you book a hike with sustainable companies like Visit.org, 100 percent of the host revenue will go towards helping the local receive much-needed services. Nature lovers will enjoy a day trip to the multi-tiered Ban Gioc Waterfall just north of Hanoi. The stunning view and pristine waters are Instagram-worthy—so don’t forget to bring your camera! Ninety miles from Hanoi, the Mai Chau Lodge is a great way to experience the tribal cultures of Vietnam, while also being pampered in modern amenities. The traditionally furnished lodge, nestled against the mountainous backdrop makes for a memorable way of taking in the countryside. Be sure to book a tour into the mountain villages so that you can witness the indigenous way of life. If you’re looking for a quiet getaway, indulge yourself at Six Senses, a luxury resort in Nha Trang, a coastal town in south Vietnam, a few hours from Saigon. This resort features sea and mountain views, as well as private pools set in the beautiful natural landscape. What’s a trip to Vietnam without visiting the Mekong Delta? This river is the lifeblood of the region, where commerce and culture meet. For a truly immersive local experience that isn’t too far off the beaten path, make sure a boat ride in the Mekong River is on your itinerary.